Sorry my posts are a little sporadic. I’m trying to find my groove while adjusting to pregnancy exhaustion and an active toddler. A while back, a friend requested that I write a blog post on how to organize a linen closet. Well, we don’t have too many linens in the first place, and they are currently all dirty, so ours looks kind of bare. Do I wish it was cuter? Sure, as with all things, but nobody is going to see it except my family. Well, and everyone who reads this. Oh well. 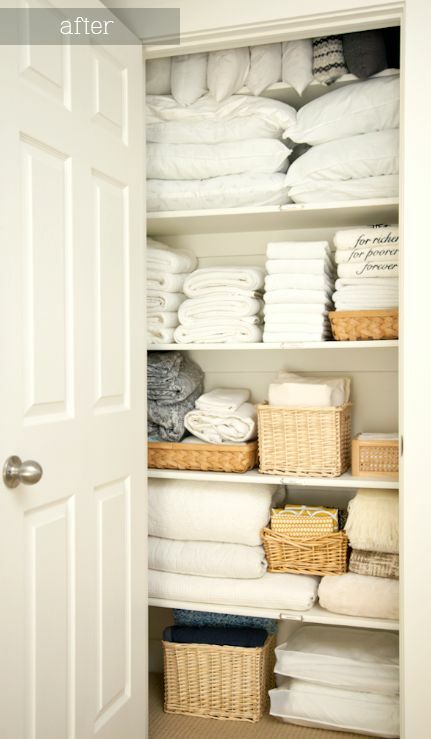 Right now, our linen closet houses an extra duvet, pillows, a few sheet sets, bath towels, hand towels, washcloths, extra soaps, toilet paper and wet wipes, and tissue boxes. 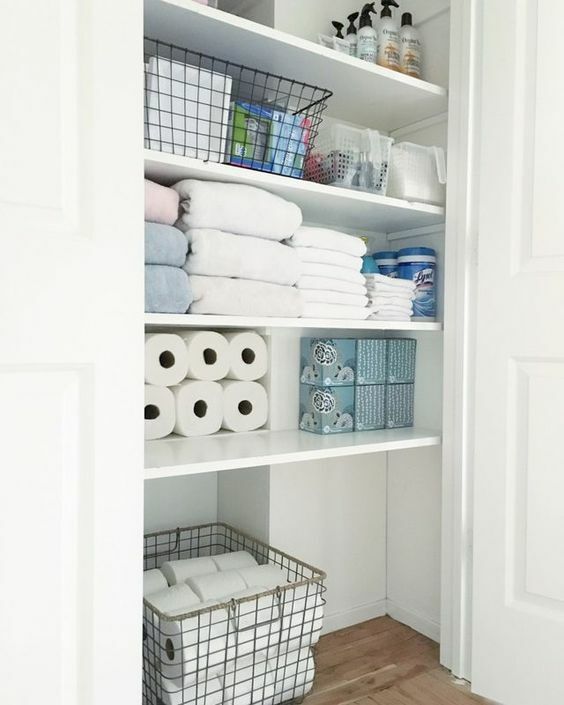 Some people keep other items in their linen closets such as medicine or cleaning products or use it as an overflow for bathroom items like shampoos, soaps, lotions, etc. Because we are a small family and it is easy for us to keep things simple, but I recognize that for others it poses a challenge. Here are some tips to keep your linen closet organized and utilize your space efficiently. How many sheet sets do you actually need? Personally, I think it’s a good idea to have 2 sheet sets per bed. One on the bed, one in the closet. That way, when it’s time to wash your sheets, and if you’re like me and always wait until the last minute late at night, you don’t have to wait for your sheets to dry. What about towels? I think 2 per person is a good rule of thumb. If you have guests over quite often, it may be a good idea to have a few extra, but I wouldn’t go overboard here. Worst case scenario, you’ll just have to do laundry more often. Soaps and other Extras? I have seen linen closet that are home to lots of extra soaps, lotions, shampoos, etc. They take up a lot of space, and it puzzles me as to why people feel the need to hoard bathroom products. If possible, keep items like this in your bathroom and keep it at a minimum. I was always taught that there was a correct way to fold towels. Now, I don’t necessarily think it’s that important. You can save space by folding your towels differently to better fit your shelves. 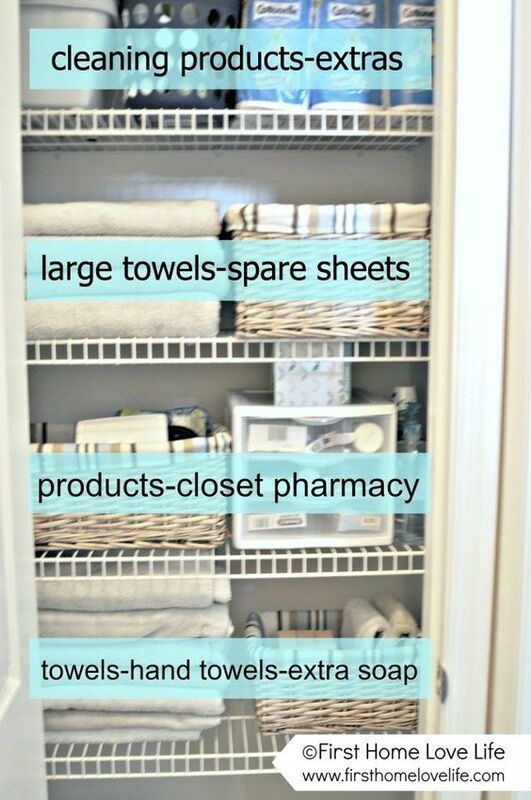 You can also roll your towels to maximize on space. Corral smaller items like soaps, wash clothes, or TP by putting them neatly into baskets or containers. You don’t have to spend a lot of money on this. Dollar tree baskets will work great! Also, if you’re not worried about how things look, you can use any boxes or bins you have on hand. If you have any other tips for keeping a linen closet organized, please leave a comment! Previous postWhat Do I Really Need for Baby?